Is the future of brewing here? – imagine being able to boil the kettle in the mornings from the comfort of your warm and cosy bed and having the water ready just how you like it when you get downstairs. Or maybe have the water boiled to your desired temperature, kept warm and ready for you when you get home late from work. All this at a touch of a button or a simple voice command – with ZERO waiting time. Hopefully, by the end of this review, you should have a good idea as to whether the AppKettle is right for you. 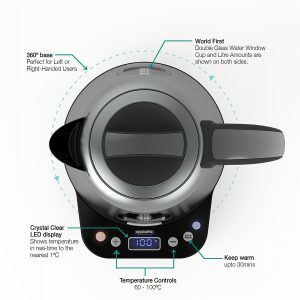 Developed in the UK, AppKettle claims to be “The World’s Smartest Kettle”; “The World’s Most Advanced and Useful Electric Kettle” and “One Of The Most Energy Efficient Kettles Available”. The makers created it to be “Convenient“; “Time-saving“; “Useful“; “Beautiful” and “Simple for Everyone“. Now, these are pretty big and bold claims – But is there any truth to them? 88% of Amazon reviewers have rated it 5/5 stars, customer reviews on the AppKettle website have rated it 5/5 stars – so what makes this product so great? In a nutshell, it’s an electric kettle – that works with an App, allowing real-time monitoring and control. 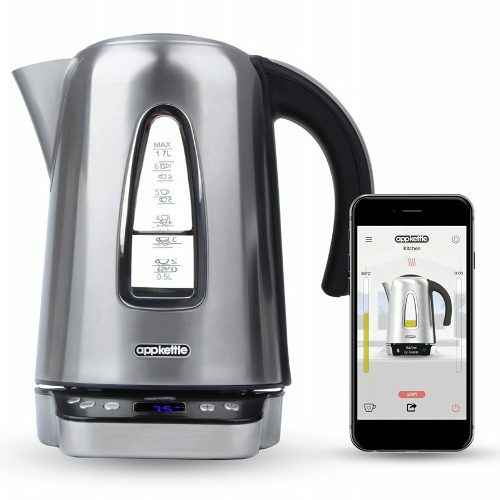 It allows you to boil a pre-filled kettle to a pre-set temperature and a pre-set time – from any mobile device at a touch of a button or a simple voice-command (if you have Amazon Echo) – from the comfort of your bed, sofa, office or anywhere where you have internet connection. Or, if you’re old school like me – there are manual buttons to turn on and use via the Base, so you don’t need to use your device every time you need a cuppa. In doing so, it saves you time and money – both much needed commodities in this day and age. 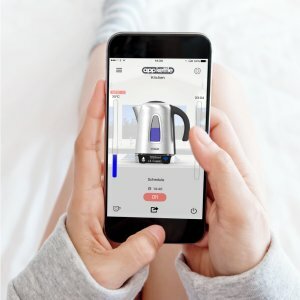 Once you’ve plugged the kettle in with its Base and downloaded the App (available FREE on iOS and Google Play), there are plenty of features you can play around with. – Adjust Temperature & Brew Time feature for your favourite drinks. One of the best features of this product. Fine-tuning your drinks and having them at the right drinking temperature helps to remove any potential impurities within the water and can actually improve and maximise the taste and flavour. If you love your green teas like me, you’ll know how bitter it tastes when you boil and brew too long! – Favourites and Scheduling feature– Having fun and playing around with the many App features will definitely use up a certain amount of your time – so the makers have created this feature to give you more time on your hands. Store your favourites for each person and schedule for the same time every week, or whenever you choose (although not able to do multi same-day schedules yet). – Keep Warm feature – Running late from work or taking longer walking the dog? No worries – AppKettle has this smart function that keeps the water at your desired temperature for up to 30 minutes. No more wasteful energy of reheating water. – Energy/Cost feature – this really cool feature allows you to keep track and monitor how much energy the kettle is using. If you know your price per kWh, then it can work out the cost of use and how much each person (who uses the App) has used too. All this is based on how much water you put in; the temperature you boil to and the Keep Warm function. Pretty smart and convenient, I must admit. 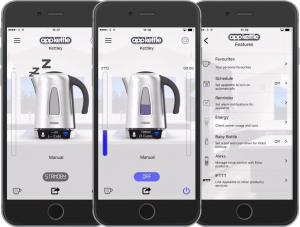 – Baby Bottle feature – Yes, AppKettle really likes convenience – so they even developed this function which allows parents to prepare their baby milk formula with ease. Having set the time to when you want the water boiled, it will cool it back down (to 70℃) and keep it warm until you’re ready to use. Very useful and time efficient for any newbie parents wanting that extra snooze! – Social Share feature – Make brewing even more fun by sending a customisable message round for a brew. Great if you work in an office; flat-share or have a big family. – Reminder feature – Oh, just don’t forget to fill it up! One of AppKettle’s goals is turning one of life’s everyday routines and hoping to made it easier and simpler – No more waiting for the kettle to boil. No more squabbling to put the kettle on when the break comes on from your favourite TV show. No more bitter tasting tea for all you tea connoisseurs. The Appkettle quite literally wants you to save time, money and adapt to new energy-saving habits. In a fast-paced and environmentally challenging society we’re living in, this is vision that it hopes to succeed in. Plus, it wants you to have fun too whilst doing the age old tradition of boiling water – something that has expanded through many generations and cultures, all over the world for thousands of years. 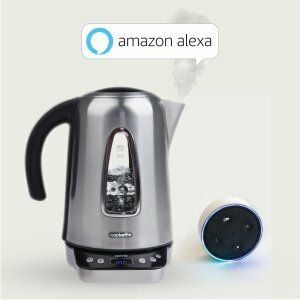 WORKS WITH ALEXA – Appkettle works with Alexa (Amazon’s A.I voice control system) so you can link your Amazon Echo products with Appkettle’s Alexa voice skill. Once you’ve downloaded the Alexa App, you can ask Alexa to switch on or off. Quite limited, but still pretty cool. WORKS WITH IFTTT – You can link your Appkettle favourites; Keep Warm and heating preferences with hundreds of smart home products and services. Once you’ve downloaded the IFTTT App and signed up for a free account, you can turn on Applets that help your apps work together to do specific things they couldn’t do otherwise. For example, you can set your light bulbs to flash subtlety a few times when the Appkettle is boiled (if you have the Philips Hue Applet). Of course, the science behind this product seems impressive, but does it actually work as advertised? * Ease of Set-up – within 5 minutes, you can download the App, set it up on your home WiFi network, input the passkey, pair your device and kettle, fill up kettle and get ready to boil. Although, one of the main problems users encountered here was connection issues with Alexa and WiFi and some problems registering the App – these were, however, quickly and competently resolved by the Customer Service/Technical Support team. * Easy-to-Use App – this is regardless of your experience with apps and technology. The intuitive App with its clear graphics has lots of features and personalised options. You can even name your kettle! Many features of the App proved to be incredibly useful and convenient and some users have even commented on how they couldn’t manage without it! Just by saving 2-3 minutes of boiling the kettle before you get out of bed or before you get home really made a huge difference and made life so much easier. * Smart Performance Features on App – the amount of smart features available to use and their capabilities were considered by some, “a God-Send” and “a Life-Saver”. Well, it has been in development for an impressive 5 years. * Energy Efficiency Feature – this is the hidden gem and considered the most useful feature. Generally, kettles are one of the most power-hungry appliances in the home. Being able to see the temperature on both the App and Base saves energy and prevents wasteful re-heating. The 2.0-2.5kW AppKettle has a standby mode that adheres to the new European Energy Standard for smart appliances. This ensures that consumption is below 2W. * Quick To Boil – one lovely Amazon reviewer took the time to record how long the kettle boiled with different amounts of water in the kettle and at different temperatures. – 1.7L (max) to 70℃ (green tea) = 2 mins 52 secs. My current conventional kettle (which is 4 years old) takes 1 min and 52 secs to boil fully with 0.5L(min) of water. Not too much of a difference it seems, but the whole point is that you don’t have to wait! It’s considered relatively quiet whilst boiling too – although I doubt it would be an issue if it was loud as mostly it would be boiled remotely and not being in the same room as the kettle. It beeps 3 times to say it’s done which some found quite annoying. It can’t be switched off either as this is due to a safety requirement. But I suppose it is helpful to those that are hard of hearing. * Easy to Fill and Pour – the wide spout allowed for smooth pouring and thanks to its removable lid, filling up is made easier. However, the ‘removable’ lid was a major concern to some as it left you exposed to steam when refilling after boiling. Plus, some parts of the lid became extremely hot, so there was a risk of burning yourself if you’re not careful. Suggestions were made for a hinged lid with a ‘push’ button release. Hopefully, it’s something the designers will consider for the future. Personally, I find smart products in the home quite invasive. It’s like a phantom in your home doing tasks that you should be doing. Yes, I understand gadgets and especially smart gadgets are designed to make life easier, but sometimes I do wonder how lazy will we become in the pursuit of this passion? The other downside I find in smart products are the potential health risks. The radiation levels emitted from them really puts me off. I always switch off my blue-tooth and WiFi on my phone for this reason alone. And the phone is the only smart product I own. Yet, I’m strangely enticed by this product – it’s sheer simplicity and potential over-rides my senses. I generally use the kettle around 6-7 times a day (as I prefer hot drinks over cold drinks especially at this time of year) – and countless times I wished I was able to have the kettle boiled and ready when I got home or came downstairs. Not only that, being a big fan of teas and herbal teas, my drinks will embrace the right temperature of water and release their full beneficial potential! With any smart remote functionality, safety will be a major priority. From the beginning, this was a fundamental concept and concern for the designers. The hardware and software prevents the kettle from being turned on accidentally. It has a Boil Dry Protection feature and will not turn on if the kettle is below the minimum level of 250ML of water (1 x cup) or above the maximum level (1.7L). AppKettle has 128-bit AES security to prevent unauthorised connections via the internet. Plus, it has WPA/WPA2 Security. The kettle has been designed with health-conscious materials with minimal plastics. The spout-filter (which is BPA-free) is the only part of the kettle where boiling water comes into contact with plastic. It comes with a brushed stainless steel design with the world’s first double glass windows. Most stainless steel kettles have plastic water windows, or no window at all. Making Life Easier by Saving Time – People loved the fact that you could boil water remotely from a device, saving precious time, morning or night. Saving money was a bonus! So easy to set-up and use – it seemed effortless with such a high-end and high-tech gadget. The easy to navigate software, with its animated water to show the heating process, makes it fun and simple to use. The Quality Design – “Elegant; “Stylish”; “Robust and sturdy”; “Felt like a premium kettle” and “The build quality and convenience justifies the price”. Enough said. The comfy handle is of a good length and grip too making it easy to pour even when full. Customer Service and Technical Support – these guys proved to be incredibly responsive and quick. Many of the issues surrounding WiFi and Alexa connections were dealt with promptly, some even over the Xmas period. “Legendary customer service”; “Unreal customer service”; “Went out of their way”. Because of their speedy resolution, many highly recommended the company and “Wouldn’t hesitate to use the company again”. Connection Issues with WiFi and Alexa – this was the main drawback. I mean, the whole point of the AppKettle is that it works with internet connection (although it’ll still work with the manual buttons on the Base, but that’s besides the point). Having said that, many of the issues here were dealt with competently and swiftly by the customer service and technical support team. The Lid – this was a big concern as it is fully removable rather than hinged, which leaves you exposed to steam when refilling after it has boiled. Also, the lid does heat up and becomes extremely hot so there is a risk of burning if you’re not careful. It seems obvious that this is no ordinary kettle. It does way more than just boil water. Yes, it’s a bit pricey – £129.99 to be precise – but when looking at products of a similar range, you would expect to pay roughly £100 for WiFi functionality alone. Add the cool design and smart concept, AppKettle offers more than just a kitchen necessity. It releases and maximises a kettles’ full potential to just boiling water. Turning one of life’s every day routines and making it simpler and easier is a feat that most designers and engineers strive for. Finding a product that works for you is a challenge in itself. If your’re searching for convenience, control and looking to reduce your carbon footprint, then I highly recommend this product. If you’re a tea lover and enthusiast, then you’ll know certain tea leaves taste better when brewed at a lower temperature other than boiling. The AppKettle takes the hassle out of waiting for the water to cool down or guessing when to switch off before boiling point. No more burnt leaves! The smart vision of future brewing is here – sure it doesn’t actually make the drink and bring it to you with some chocolate biscuits and a hug – but this is the beginnings of a new chapter for brew-making. I give this product a definite thumbs up! – 5/5. I hope you enjoyed the review. If you have any questions or comments about the Appkettle, please leave them below. Peace be with you and happy brewing! Heh, what will they think of next? A kettle that uses an app sounds really handy, though. I mean, you could technically turn it on from anywhere, right? So you could be trudging home in the cold and snow and have a nice hot kettle of water waiting when you walk in. I think I like this idea. Technically, yes you can, as long as you have internet connection where you are – otherwise it’s a case of having a loving person at home to switch it on for you! This is quite interesting. I feel that this is like other kettles and one of the main distinction obviously is that it works with an app. And this is quite cool! The fact that you can play around with it with it’s temperature with the app is definitely futuristic. I guess as you also mentioned, if the wifi gives problems, then the whole thing falls apart. Without the app being useful, I feel like it becomes like every other kettle out there. Have you used this yourself? Because a lot of times what we see isn’t really what it is like once we buy it. The AppKettle would still work without WiFi access due to the old school manual buttons on the base. However, if you live in an area with limited internet connection, then the price tag isn’t worth it and you might as well get a regular kettle! Fortunately, most of the world is getting better connected, so unless you live in freezing Antarctica or the deep depths of the Amazon rain forest, then you’ll be fine. Personally, I haven’t used the gadget yet as the life of a blogger hasn’t enabled me to afford one just yet, although it is on definitely top of my wish list! Have a great weekend and peace be with you. I had not heard about this product AppKettle until I got stumbled upon your review article. And I am very glad with people like you. who take the effort to provide a comprehensive review of AppKettle. I think this product will be useful also to people who are so busy in their lives not even a minute to waste. And definitely to have this Appkettle at the office and at home will make busy lives more manageable. I’m glad you liked the review. Once in a while, there are some gadgets that are really worth it’s while – and the AppKettle is no exception. Definitely worth the buy if you’re looking for convenience, control and reducing your carbon footprint. Thanks Tereasa for your review of the Appkettle. It looks like a really cool design and it would probably look great sitting on my kitchen counter. I am trying to stop drinking so much coffee and switch over to decaffeinated tea instead but I have not been able to do it so far. Maybe the Appkettle would help me make the switch. The price is the only thing that concerns me, I may have to wait until Christmas. I’m pretty sure this kettle will look good in anyone’s kitchen! I’m a big fan of both coffee and tea and this is ideal for both so you get the best out of your drinks. I hope you do get one for Xmas and pop back and let me know how you got on with it. Happy brewing in the mean time and peace be with you. This little gadget will definitely work great in your small law firm and I’m sure you’ll have a blast with the social sharing function. Any excuse to get away from doing some work! Happy brewing and peace be with you. Since I visited China and came back with a ton (not literally but close) of green tea, I’ve been trying to drink it all up. Sadly, I forget half of the time. Setting the right temp and time is perfect to get that non-bitter cup of tea. I try to have at least one cup in the morning and one in the evening so being able to schedule it is nice. Correct me if I misunderstood but I can’t set multiple schedules for the same day correct? That’s a little disappointing as I’ll have to manually intervene to get my evening cup (assuming I schedule the morning one, which makes sense to me to do). We’re just a 2 person home so the multi-person feature probably won’t get used much but it’s nice to have the option. I’m actually afraid to use the energy cost feature. I can see it now “My tea costs me what every day?!). I can’t imagine anyone wants to see my tea drinking schedule on social media but I can see some people using it. Maybe it’s a good way to let my co-workers know I’ve been caffeinated and will be easy to work with ;). I have Alexa all over the house so that integration is awesome! I don’t yet use IFTT but have been eying it for some time and can see that maybe I can get the evening tea I want if I put together an IFTT that says “Hey, Scott just got home. Start brewing”. I have one request… Can you find and review some sort of automation system that will fill the kettle with water and add my tea so I don’t have to do anything? Maybe even deliver it to me. Is there a robot I can use for this purpose? Thanks for the great review. I might just have to pick one of these up. You never know, with the advancement of science and technology, hopefully in the not so distant future, there maybe a robot that can do just that! Remember the film Wall-E? Yes, unfortunately you can’t seem to do multi same-day schedules yet, which is a bummer, cos I use the kettle many times a day! But again, maybe something the designers will implement in the future. Thanks for your positive vibes and let me know of your experiences whenever you get your hands on one of these. One of the best products for sure. I never saw that some product work with an app but this is incredible. I will for sure buy one for me and my girlfriend because we like to prepare hot meals and shakes. It is incredible what science have done so far. Thank you for showing us this beautiful product. Thanks for popping by and sharing your thoughts. I would love to know of your experiences of this cool little gadget when you get one! wow AppKettle looks awesome and something that I would totally benefit from. I am a mate drinker, a hot infusion from South America. I also love tea and coffee but mate is a must everyday. And it has to be prepared with water at 80 degrees, not more or less. With normal kettles I have to guess the temperature, and I’ve actually gotten good at it, but it’s not the most convenient. Having AppKettle would be great. I can make the water boil at 80 degrees in the morning even before I get out of bed! Really happy you liked my review. I know for any tea and coffee fans, this gadget is a must. I hope you do buy it and return to let me know of your experiences with it. Wow!!! This is amazing!!! I’m so glad I read this article!! I love making tea! Green tea and Matcha Tea are my favorite, and this product seems like it makes the process so much better, and easier! I love how it works with an app, and with Alexa too! The technology now a days is awesome! This would be a great gift idea, not for just myself, but for friends and family as well!!! I’m a huge fan of green tea too! Gadgets are amazing little things especially when it makes our lives easier and this one’s no exception. I love the fact that it seems so simple to use. Happy brewing and thanks for reading. Peace be with you. The Internet of Things age intrigues me so much. They can now actually make boiling water fun. lol. I love that it integrates with Alexa and how you can set a timer. Overbrewed tea is as you state really bitter. Does it come with pre-programmed functions for different teas or do you have to manually set the brew time each time you use it? Great for coffe drinkers as well as many people don’t know that coffee isn’t meant to be brewed in boiling water. Thanks for this. It looks like something I would really use a lot and I will consider getting one. there is a temperature guide especially for the different types of teas, for example. green, black, yellow, oolong, white and herbal tea. Plus, it tells you how long to steep them for too. You can also adjust the temperature according to your tastes and store your favourites so you don’t have to manually set it each time. Hope that helps and let me know of your experiences if you ever get one of these cool gadgets. Wow I never knew there was such a thing as an electric kettle! That’s actually a pretty neat and energy saving idea! this is the perfect little gadget for you then! Yes absolutely, it does work with Android. Just need to download from the Play store and off you go. Thanks for reading and happy brewing! Glad you liked the review – maybe get one for your wife as a gift, hey it’s International Women’s Day today – perfect to celebrate the day with a kettle that can save you both valuable time! Lol – Thanks for your comments. This thing is awesome! I love smart home gadgets and I am always looking for new stuff that I can add to my home. I have already a few smart home gadgets including Amazon Alexa. I will definitely get it! Thank you for that great review! Thanks for the comments Cezary. You’re definitely onto a winner here for any smart automated home. There was a news item today with some users experiencing eerie laughing coming from their Alexa speaker! – sppoky ! – hope this didn’t effect you! Thanks for visiting. Great review about the Appkettle indeed. Just wondered how technology is making life better and easier to live everyday especially with regard to the things which seem to be mundane. In fact, when I read this post for the first time i thought you were just trying to tease your audience. I liked your in depth research about this Appkettle and your analysis of what it will be capable of doing and how advantageous it will be. Yes Benito, the future of brewing is definitely here! I’m constantly amazed by the speed and the way technology has changed our way of living to make it easier (and sometimes lazier!). Thanks for your comments and appreciate your visit. Peace be with you. I’ve never heard of this type of kettle before, until now.. very innovative! This would definitely be very handy for those big tea drinkers that are always on the go, and need to have the water ready for them instead of waiting. I also like the idea that you can have the water set to a certain temp, ready for baby bottles – we all know how busy moms are especially with a baby, getting up at various times of the night etc. I wonder, if there is a coffee maker like this – with an app and all? it is a very clever little product isn’t it? And becoming more and more popular – the time saving feature is one the main selling points of this product and I really feel the makers have achieved this – with our busy lifestyles and schedules, having the water ready when you want just seems bliss! 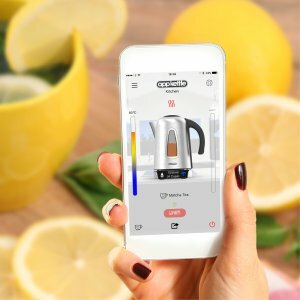 I’m not sure whether there is a coffee maker and app similar to this but if there is, I’ll like to review it as I’m a big coffee drinker too. Thanks for reading. This kettle is such a great product as I am using it at the moment. One of the best buys I have ever got. I agree with each and every feature your have explained in your review. This is a “must have” product I must say. so happy to know you own the product and loving it! Can I ask if you’ve had any issues that have been mentioned in the post before? I loved the article. It’s so detailed and inforrmative. In fact, I just recently purchased an electric kettle, the quality is decent for the price I paid for. But it does not have the smart technology like the one you reviewed. I like how you can set the temperature and able to mamage many things using the app. I wished I had seen your review sooner before I purchased my current one. I will definitely keep this product in mind when it comes to replacing my current one. Thank you for sharing. Keep up with the great work. Looking forward to reading your next review. Oh what a shame you just bought your new electric kettle! Never mind – so glad you found it informative and hopefully useful for your future kettle purchases!. The temperature setting is my favourite feature on this as fine tuning your drinks at the right temperature really does bring out the taste and flavour. Thanks for stopping by! Wow I love this kettle. Knowing I can kick it on from my bed on a cold winter’s morning is great. Temperature control is must with a kettle. Glad this has it. It’s in my shopping cart. Thanks for showing me this. I hope you do manage to purchase this and visit back with your experiences. Wow.. You’re review is seriously amazing. Really smart and useful app. I would like to grab it someday because it really fits me considering that I’m lazy. Gadgets are designed to make life easier and lazy at times, but this is one I definitely don’t mind being lazy to! Thanks for reading. Being an heavy tea drinker, this could be my dream kettle! But I wasn’t aware that kettles too could function with a smartphone app! The great thing here is that you can adjust the boil time and temperature to fit your needs. And I can see that you can control it with your voice… How cool is that???!!! You won’t have any excuse to make a bad tea!!!!! That’s true! No more bitter or burnt teas – the temperature control is IMHO, the best feature on this cool product. It does seem like a smart and useful little gadget doesn’t it? Lots of features to play around with and something for everyone it seems. Thanks for reading. One great review about AppKettle. AppKettle is really a basic necessity for the people with a busy schedule. Its rich features are really amazing and convenient for easy use. Features like Baby Bottle, wifi , Alexa compatibility are great and I really move forward to have one such wonderful tea maker. In my point of view, It’s a must buy product as a smart home solution appliance. You’re most welcome Himbru. Thanks for your comments – you’re right that’s its a necessity for our busy lifestyles nowadays. It is probably the only home smart appliance I don’t mind having in the home! This is a very comprehensive review. All the information are nicely laid out. I am amazed by how technology has advanced to the point that I lost track of it. Your review has kept me updated. Thank you. I love drinking teas, especially after a heavy meal. Agreed with you that the correct temperature that is below boiling point is needed to brew a good cuppa. At times, I don’t wait for it to cool down. It is good to know that the Appkettle can eliminate this issue. Honestly, I don’t think I can afford this now but will keep in mind. Thank you for sharing such as informative review. You’re most welcome Sharon. Technology is moving so fast that if we sometimes don’t keep track of it, we’d be lost in a sea of gadgets and gizmos! Thanks for stopping by. I just read your AppKettle post — wonderful post, and I left a comment. Your site design is quite lovely and relative to your niche. I’m inspired to drink tea and I look forward to reading more posts from you. You offer great details to just about anyone in any type of lifestyle and how AppKettle could benefit them. Maybe consider making your font a bit bigger or brighter given the busy background on the site. Otherwise – Great job! I have been meaning to make my fonts bigger! – just haven’t got round to it yet! Thanks for the reminder and for visiting. Great site! Tea heaven. I used to be an avid tea drinker and you may have inspired me to get back to it on a serious level. I loved your comment about finding smart products to be invasive. I am a very hands on, manual type of person. I don’t like crockpots or other “set it and forget it” gadgets, but yes, this one may be something to try with all the features and the ability to have a good tasting cup of tea at anytime. Thank you this wonderful post! thanks so much for visiting and commenting. I’m really glad my site has inspired you to get back into tea drinking as its so beneficial for mind, body and soul. I think the best feature on the AppKettle is the temperature control for my teas. Have a happy tea drinking week! But what I am really looking for is a kettle that actually heats up the water to the temperature I want. 70°C should be 70°C and not 65 or 75! I guess that one will do? What works for others might not be for some others – I agree that the temperature control is the best feature on this. Thanks for reading and you’re welcome Manny. Now a days it seems like they are making everything smart and integrating it with your smart phone via a app. One day there will truly be an app for everything! 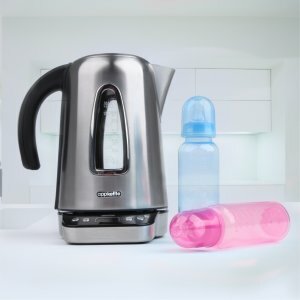 The baby bottle feature is a pretty cool add-on and I think for the most part will be the selling point for the appkettle! Cool little device but I also wonder when will it go so far to the point where the scene from Wall-E becomes reality and we are all obese in hovering chairs. Yes, the film Wall-E really springs to mind, doesn’t it?! Let’s hope it not too near the future – thanks for stopping by. Your review of the AppKettle is very thorough and informative! Great work describing all of the nuances of the product, the good, the bad, as well as what kind of people would benefit from the AppKettle. I love to make french press coffee every morning and use an electric kettle to heat my water to pour in the press. Sometimes it is so frustrating the water gets too hot (boils) or doesn’t get hot enough. It would be so useful to program it to be a certain temperature most ideal for french press coffee making. I will surely be keeping this kettle on my list! Thank you for sharing this really innovative product! Thanks for your comments Ciara. It is certainly a useful little gadget to have in the home and I hope you do get your hands on one as it works well for coffees too. Have a lovely week. Thank for this review! Not surprised that it was developed in the UK as we love our tea here and the water temperature is important for good cuppa of tea! Thanks for stopping by Joe….I absolutely agree this a great device for gadget lovers! And it does seem to good to be true…I hope you do get this for you and your wife and stop by in the future to let me know your experiences. Have a great week. WOW! Now i want one. I am already overweight so if I get this, I probably will be even more. Although, it will make it easier for me to drink my green tea. I can totally relate to the bitter taste of the green tea when the water is too hot and the green tea bag left in too long… But the appkettle sounds like an amazing product. I will try it out very soon and will tell you how it goes. SPecially because we are in the middle of winter, it would feel so good to come home and indulge in a cup of hot tea to heat me up. That’s great Reyhana. It would fantastic to get your comments and experiences on the this. It will definitely shave time off your brew! Great review on the Apkettle. I use the traditional kettle and would love to switch over. I just recently got into drinking teas and steeping different herbals. I’m glad i found your site that i can draw on for reference. How is the technical side of the APP ? Does it ever crash or bug out? I hate to invest in technology that renders itself obsolete because of app flaws. I know just who i will gift this to and they will appreciate it. I’m glad you found my review useful. From my research, I found no issues with the App from users. As mentioned in the review, it was the connection with WiFi and Alexa problems that had arisen which were competently resolved by the customer/technical team. Have a great week. The AppKettle certainly takes making a cup of tea to the next level. Anything that can save me time in my fast paced day is definitely welcomed. I am constantly amazed at all the great technology that we have at our finger tips. It sounds like a really great product. I appreciate your in depth review. Thanks Lisa for reading and leaving your comment. I’m too at awe with the cool technology we have and also wonder what will be available in the next generations to come! I was looking for a smart kettle and I begin my research. I found there was another kettle, I think by Xiaomi which appears to have the same concept as this! Also, like you, I enjoy hot drinks to cold drinks thus this was a nice addition. Really interesting to have brought up the point of safety! Will definitely consider purchasing this! I have heard about Xiaomi kettle too – maybe I’ll review that too as a future post. Thanks for reading. What will they think of next!! This is a way too cool appliance that is perfect for a tea connoisseur and self confessed gadget gal like myself. One quick question though, If my smart phone is not near a Wi-Fi connection (like if I am on the road – pulled over the side of the road of course), would I still be able to signal the kettle to start heating through my smart phone’s data plan? that’s a good question and I don’t think why you can’t still use your phone’s data plan to work the AppKettle when there’s no WiFi connection as essentially they both let you use the internet wirelessly. Thanks for reading! My wife and I have been getting more into tea making, but as it is we tend to just heat the water and put the tea in a strainer (loose leaf in many cases) and go… However even if your not a huge tea snob you can easily tell when water is under/over the proper heat to steep the tea properly. This looks like it would be a great and cost effective way to get the proper heat for the exact type of tea we are brewing to get the best flavor, not to mention the proper health benefits of correctly brewed tea for its type. I think this unit may easily find a spot on my birthday wish list this year. That’s right Thomas, I know when I’ve made green tea and over boiled and steeped too long – the tea does taste incredibly bitter! I think your teas will definitely embrace the right water temperature to release their full potential. I hope you do get this for your birthday and let me know your thoughts and experiences on this time-saving gadget. Happy brewing! What a thorough review of a great gadget that any tealover would dream of. You described the product from beginning to end so there are no doubts on how it works, and what is for and who should own one. I think I will put this in my Christmas wish list! Hopefully I will get one! Whenever you want a tea, you remember that it takes time to boil the water, but with this one, it should be quick. P.S. Your site looks wonderful! thanks for reading and sending the positive vibes. I hope you do get this for Xmas and pop back to let me know what you think of the product. Have a great weekend! Many thanks for this awesome review and everyday, our world and life is being made easier and easier. This is a super technically advanced device and I suspect that we should’nt be surprised by what this apparatus is capable of. For the busy commuter, this is a godsend and will definitely remove some of the stresses of the day, for sure. One question that I had has been answered, as I read through your post and that was the Boil Dry Protection feature, which is so important, as sometimes we may to forget to top up the kettle itself. Well done for posting a great review. Thanks very much for your comments Phil. I’m really happy you have found the review helpful as it really is a great little gadget. Shaving time off waiting for a brew is a Godsend for all! I just bought this kettle as this one was on my list for a long time. Your review save my time dramatically and I just confirmed my first idea to purchase this powerful machine. I’m so glad to hear you benefitted from my review Marty! I hope you get the most out of your purchase. I would love to hear your thoughts and experiences on your new AppKettle. Happy brewing! My wife and I recently read about the health benefits of drinking tea particularly for blood pressure help and antioxidants. Before this, we’ve been coffee addicts. One of the thing we have noticed with our beverage appliances is that they require regular descaling with store bought solutions. If we don’t, the temperature and output are affected. Is that an issue for this device as well? I really like being able to set the temperature. that’s a very good question, a kettle full of lime-scale really does wastes electricity! The AppKettle has a concealed element to help reduce the build up of lime-scale and also has a removable stainless steel lime-scale filter. Also, it depends whether you a blessed enough to live in an area with soft water and not hard water to prevent more lime-scale build up. The kettle has been designed to be easily cleaned and the stainless steel build means you can use natural cleaning methods. A mixture of cider vinegar and water is the best according to kettle creator, Robert Hill. Hope that answers your question. Have a great day! Hi there, seems like a great site, I would love to check it out, since I love herbal tea. I clicked on your site and it said nothing was found.. Was trying to leave a comment and check it out. Just wanted to let you know that your site was saying that! there seems to be a feature for everyone on this product which makes it so great. I only have a smart phone at home but the thought of having this would certainly make life so much easier. I hope you return to let me know of your experiences on this when you get your hands on one. Happy new year! Say what?! There’s a smart kettle out there? You just have to love the 21st century. I had no idea! I can definitely imagine that this is a very useful product. As I’m writing this I’m actually waiting for my tea to cool down so I can drink it. Since I already finished my breakfast I’m losing time here, so that would only be enough reason for me to buy it. I’m almost ashamed to admit, but I didn’t even know you have to cook water to 70 degrees for green tea. I always cook it until it boils.. I’m wondering whether it is a lot harder to cook water to 70 degrees without a smart kettle like this? I believe it is harder Sergio. I know the numerous times I’ve forgotten to switch the kettle off before it reaches boiling point for my green teas only then having to wait around for it to cool down! 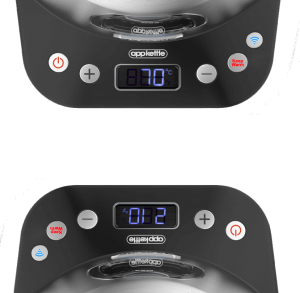 The AppKettle will definitely shave time off waiting for a brew and make your teas taste better too. This is a GAME CHANGER!! Probably one of the greatest but little steps to the smart home technology. It’s actually basedon a great idea. Making our lves easier by automating processes. Exactly one of the things that I was looking for!! I wouldn’t have imagined if it wasn’t integrated with Alexa. Now everyone can focus on their morning while kettle boils itself. I agree it is a game changer. IMHO this is by far the smartest house gadget on the market as everyone uses the kettle. Thanks for your feedback. Hello there! My mom loves to use her old kettle but every time she uses her phone she keeps on forgetting it. I read your review about app kettle and I found it very informative and helpful. This is a really great piece of technology to help my mom not forget that she’s using the kettle. I really appreciate your review and I will surely buy one of this for my mom. I’m so glad you found the review helpful John. It really is a great gadget to have around the house as it sends you a reminder too when you set the brew timer. Please feel free to come and visit again when you do get one for your mum as I love to hear your experiences too. Setting the temperature and time remotely using the app is definitely an incredible feature for a kettle. The baby bottle feature that provides water that is fully boiled and cooled down to +70°c at a set time is definitely a boon for newbie parents in preparing baby food. Being able to see the temperature on both the App and Base saves energy and prevents wasteful re-heating. These salient features along with the others that have been brought out by you makes the Appkettle a desirable one to have at home. A great review of the Appkettle. thanks for the feedback, the AppKettle certainly has so many features to play around with that any home would benefit from this. For me, the best feature is the adjustable temperature for my green teas! Great review on the appkettle. I like to mention how awesome your site looks, it looks wonderful. When I was reading, I like how you gave your actual opinion about the appkettle; you mentioned your thought about how lazy you would become. Though it may be true, I find this really helpful for my health and fitness; I’m going to come back soon, I don’t have the money unfortunately but I am excited to try it out. Thanks! Thanks Marques for stopping by. It really does seem like a useful little gadget to try out. I hope you do manage to try one out and come back soon with your thoughts and experiences.